Is Contract Growing For You? Last week the VT Food Venture Center hosted a panel discussion on contract growing. The focus of the event was to discuss the opportunities for vegetable producers entering into contracts with food processors. Contract growing is not the high margin, niche product, direct-to-consumer business model that often becomes associated with VT “local food”. This event reflects the “scaling up” of local food. Robust food systems need lower cost/higher volume producers to provide the produce and the food manufacturers to convert it to the final form that the market place demands. So, is contract growing right for you? Here is short list of considerations for contract growing. At the bottom we have posted a nice legal overview of contract agriculture. High Volume Delivery: Processors get more efficient when they can run their lines longer. A full day of product is better than 2/3 a day. Several hundred to 1/2 Ton deliveries will be the norm. Product Specification: Processors have clear specifications for each crop and contracts will reflect that. Expect to get paid a better price when you hit or exceed spec’s. Expect to be paid less if you can’t hit the specs. Do you have the skills to produce to these spec’s? Do you have the technology or the labor to grade out your produce according to specifications? Mechanization in the Field: Higher volume contracts fit well with farms looking to invest in specialized equipment to grow the crops with the necessary mechanization. Streamlined Market Communications: Working with a small number of buyers is expected to require far less communication and marketing materials compared to a business that manages relationships with dozens of buyers (or hundreds of subscription members). Legal and Risk Planning: Contracts might require legal review. Farm owners will need to explore insurance and contingency plans to deal with the consequences of losing a crop, not hitting specs or not fulfilling the full contract. New machinery custom rates for 2013 have been published by Pennsylvania’s National Agriculture Statistics Service. Their report provides average rates for many categories within primary tillage, planting, haymaking, silage making, hauling, spraying/fertilizer/manure, tractor rental and other. Rates have gone up for numerous activities. If you plan to hire someone for custom activities you can expect to be charged higher rates. If you are providing custom services, be sure to evaluate your own expenses so that you can adjust your own rates to the proper amount. Merchandising: what is wrong here? What is wrong with this picture? This is a bunch of kale for sale last week at a supermarket. I have a serious problem with the “merchandising” of this product. I have a problem as a consumer and as a farm business specialist. I’ll give you a hint, think of the 5 P’s of Marketing. Did you get it? Narrow it down to two P’s….product and price. Trick question right, I did not tell you the price of this product. Stick with me for 2 paragraphs and I give you the answer. For this case, the definition of merchandising is the act of promoting products for sale in a retail setting . This is the retailer’s grand chance to do what retailers do…present a product to the customer to make them want to buy it. How is your merchandising? Are you doing a good job getting customers excited to buy your products and then creating a good atmosphere for them to make the final purchase? Remember the 5 P’s of marketing: Product, Price, People, Place and Promotion. Place is covered, I’m already in the store. 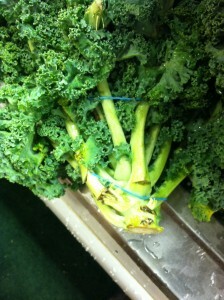 People: the produce lady smiled at me when I started taking pics of her kale. Promotion: the store sends out flyers and sales updates. Product: Getting warmer….take a close look at this product. Does anyone notice the top of the kale stalk still attached here, about 4 inches worth. I’ve sold kale before, usually we bunch the leaves. On occasion you’ll see a top cut but here is my problem, Price. They priced this product by the pound. So I am paying for the weight of that 4 inches of kale stalk. I would have preferred to see this product priced by the each, so the consumers that got 5 inches of stalk vs. 3 inches of stalk still got the same value in usable kale. Call me picky or thrifty, but remember… The customer is always right!